Ever get that gnawing feeling like you NEED to decorate your porch for fall…TODAY? Oh good, me too. Yesterday I woke up with THAT feeling. I knew I had a few free hours in the afternoon, and I saw the chance to get it done. I wasn’t sure what to do this year, and I hadn’t had any big epiphanies yet…but no matter. That would come. Just GET THE PUMPKINS, JANNA. 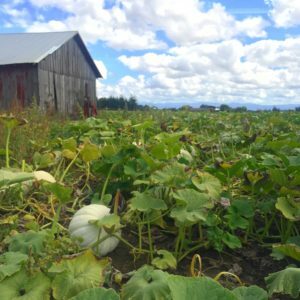 I called my favorite local farm (Bauman’s Farm in Gervais, Oregon) and asked if they had pumpkins yet. “None picked,” she said. Hmmm. 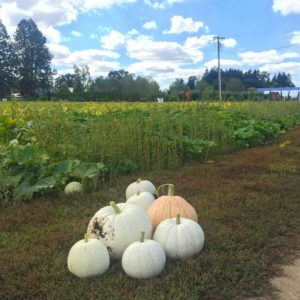 I started having visions of picking my own pumpkins, which was EVEN better. 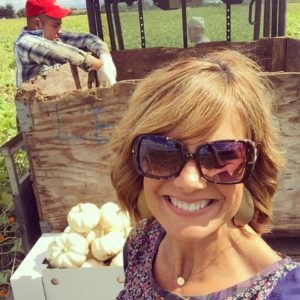 Sure enough, the great folks at Bauman’s allowed me to come out and pick my own, and it was the HIGHLIGHT of this farm girl’s week. These little white pumpkins will be used inside the house…but hey, ya gotta get ’em while you can! Here’s the start of my “pumpkin pile”…How GORGEOUS are these??? We went on to Al’s Garden Center in Woodburn to get cornstalks, hay, and mums, and we were all set. On the drive home, it happened. No really, IT HAPPENED. The epiphany I had been waiting for. Yesssss. That $5 ladder we got at an estate sale over the weekend? Perfect centerpiece for our fall porch. Here’s most of the haul from the farm and Al’s, just sitting there looking pretty. Time to roll up the sleeves and dig in! I must say, fall porch decorating is really the most FUN porch decorating there is, because it’s all about ACTUAL stuff from the farm. 🙂 It was about 1000 degrees on my porch yesterday, but hey, time for some AUTUMN up in here! In the front doorway, some corn stalks, hay, and pumpkins were just the ticket. One of my favorite old white chairs is the perfect spot to plop this pretty trio of Cinderella pumpkins. Nature is the best place to shop for fall decor! So how ’bout you? What are your plans for your front porch this season? What can you repurpose or reimagine? If you’re like me, giving yourself a little window of time and a deadline is a fun challenge…it really makes you see things in a new way! 1. Keep it simple. Let your “focal point” take center stage. This ladder was a fun option because of its rustic qualities, but MOST of all because of the height! I can’t lean anything against the wall behind these chairs due to the windows, so the ladder provided me with a framework for decor. 2. Pattern mixing brings interest. I decided to stick with a tight color palette…black, white, and orange (I know, so unusual for fall! haha), but the different patterns make it fun and the addition of some burlap-colored items grounds it, giving that rustic appeal. 4. Go look in your garage or in the back of that one closet. I bet you have something just waiting to be repurposed for your porch! I can’t wait to hear what you find! Denise - Such a warm and inviting space! Love what you created!